Meditation in the workplace can be a good way of appreciating the idea that meditating is not something confinable to a once a day practice but something that can be applied to all aspects of your life. By meditating in the workplace in both formal and non-formal ways, you can help to develop in yourself a sense of mindfulness that will contribute to your creativity as well as helping you to form a more positive attitude to work. It is also useful if you have to spend long hours in the workplace and can find 15 to 20 minutes away from your work duties once a day or so. If you work with colleagues it is worth arranging a time to meditate around what they do, explaining what you are doing, whilst taking into account that meditation will meet with some hostility in some work cultures. If it does, don’t let this bother you - clearly, if you are not physically getting in the way, or shirking responsibilities, there is nothing to stop you from formally meditating at work. Otherwise, it is possible to practice meditation, or ‘mindfulness’ (see related article) through your everyday practice. It is worth considering that one of the four main branches of Yogic practice, ‘Karma Yoga’ is dedicated principally to Enlightenment through dedication to your duty. The wide profusion of images of Eastern monks and laymen performing mundane tasks for hours on end owes itself to just this concept, which runs through Eastern thought. When bored at work one may notice how slowly the time passes as you struggle to fill your mind with an array of distractions. Anyone who has, at this point forcibly made themselves just get on with their task, paying attention to detail and becoming absorbed in their work will find how easily how much easier this in fact is than slouching around being bored. Being mindful of the moment and paying attention to sensations as they arise is actually much more natural a state than attempting to shut off from work by escaping into other thoughts. This is because daydreaming after another better job, scoring the wining goal in the World Cup, a love affair, and so on, is a desire that will be thwarted in the moment, whereas accepting the moment and becoming absorbed implies a natural acceptance of things as are, that will result in a better future. Put simply, the future you dream of is liable to happen much more quickly if you stop dreaming of it and dedicate yourself entirely to the task in hand, however far from your ideal future that may be! This concept tallies well with the spiritual concept of Karma - the idea that you will reap what you sow - although its mechanics are pure common sense to both a spiritual believer and a secular practitioner of meditation and mindfulness. 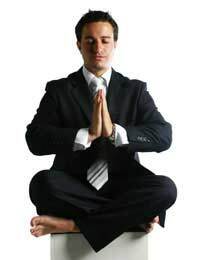 Whether you choose to meditate formally in the workplace in the interest of fitting meditation around your busy schedule, or you choose to meditate informally by being mindful about your work, you will reap the benefits, both as your stress levels are reduced and as your day to day performance, life prospects and ambitions change and grow.